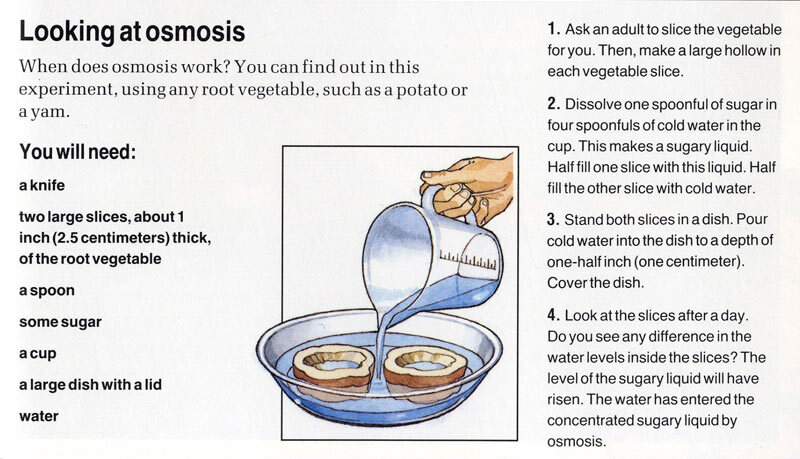 Home / Plants / Water / What is Osmosis? When we feel thirsty we have a drink. We take water into our bodies by swallowing it. So how do they take in water? On a plant's roots, there are tiny growths called root hairs. 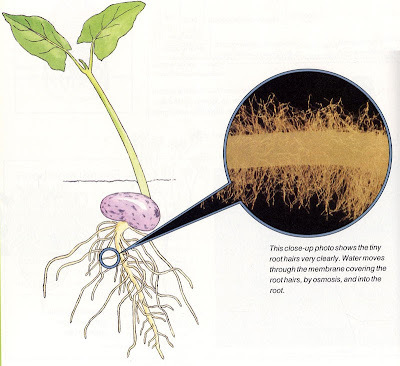 Plants take in water and nutrients through their root hairs, using a process called osmosis. Osmosis is the movement of liquid from one solution into another through a membrane that separates them. A solution is a mixture of a liquid and some dissolved substances. A membrane is a thin "skin" that allows some substances, but not others, to pass through. During osmosis, water containing nutrients moves from the soil, through membranes covering the root hairs, and into the roots. The membranes allow the water to seep into the root hairs, and also prevent nutrient-rich liquid from leaving the roots. This close-up photo shows the tiny root hairs very clearly. Water moves through the membrane covering the root hairs, by osmosis, and into the root. Water enters the plant through its root hairs. In plants the food is made into the leaves, from where it travels to other parts, such as the stems and roots. Plants have a juice inside them called sap. The sap is like the blood of the plant. In many plants, it flows through special tubes, called phloem, which carry the sugars to all the plant's cells. If you cut off the stem of some plants, such as the sugar cane, you will see a drop of sap forming at the cut end. This sap contains sugars which feed the plant, and we can use it to make sugar. Some plants contain other liquids, which we can use. We can make rubber out of the milky liquid that oozes out of rubber trees. 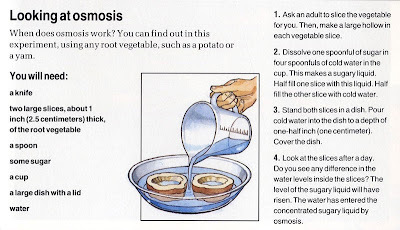 You can find out in this experiment, using any root vegetable, such as a potato or a yam.